You can earn 128 Club VM Points on this product! Synergy Beading Wire .015 - 49 strand - 30ft. Synergy Beading Wire .015 - 49 strand - 110ft. Synergy Beading Wire .019 - 49 strand - 110ft. Synergy Beading Wire .015 - 49 strand - 1000ft. Synergy Beading Wire .024 - 49 strand - 1000ft. 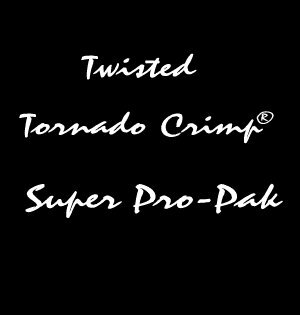 Are you a Twisted Tornado Crimp® Pro? 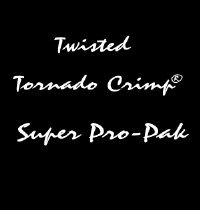 You need the Twisted Tornado Crimp® SUPER PRO-PAK ULTRAPLATE®! Save an additional 20% when you purchase a Twisted Tornado Crimp ® SUPER PRO-PAK ULTRAPLATE®. The Twisted Tornado Crimp® SUPER PRO-PAK ULTRAPLATE® is a full package of .019 and .024 99.9% Pure Silver ULTRAPLATE®, 019 and .024 24kt. Gold ULTRAPLATE® Twisted Tornado Crimps® ,.019 and .024 99.9% Pure Silver Moonlight ULTRAPLATE®, .019 and .024 Bella Flamed Copper, and 019 and .024 24kt. Russian Gold ULTRAPLATE® Twisted Tornado Crimps all in one. Each package consists of 50 pieces for a total of 500 pieces. How do you use the product? : This is a great product, I know that my necklace and bracelet endings are secure and look great. That makes me happy. and I've been using the crimps for many years.